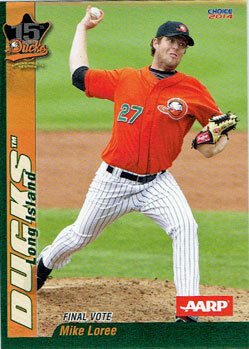 From 2005 through 2010, I was very involved in following Atlantic League baseball. So I really enjoy sets like this year’s Long Island Ducks 15th Anniversary Season team set that my friend Kristi picked up for me during a recent trip to Bethpage Ballpark. The 16-card set includes 13 players who were chosen as the best to play their position in franchise history, as well as the team’s best manager, a player who received the “final vote” and an unnumbered checklist card. I think all of the player choices are solid ones, but I’d be interested in hearing from any Ducks fans on what they think of the selections. 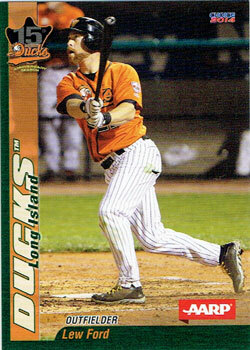 AARP sponsored this particular baseball card set… I will do my best not to ponder the significance of that fact. It’s interesting to see the different home uniforms they have worn across the years. One minor drawback – in several of the photos, shadows from the bill of the player’s cap hide their face to some degree. I understand that with the older players, photo selection may be limited. 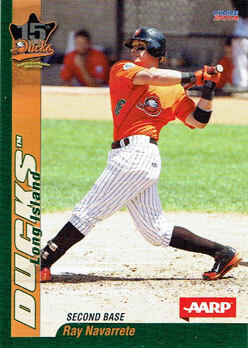 However, I’m sure the team could have provided a more flattering image of Kevin Baez. 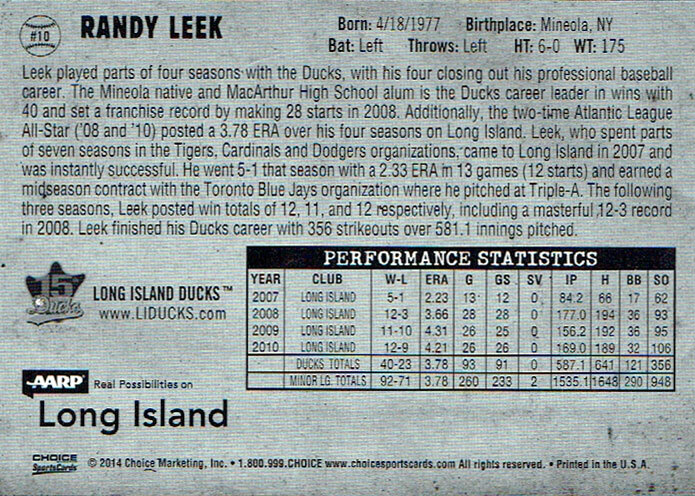 The card backs include each player’s stats with the Long Island Ducks and a brief paragraph highlighting their achievements with the team. Overall, this is a very nice baseball card set that should appeal to anyone who is interested in the Ducks or Atlantic League history. Next Post Someone’s interested in bringing baseball back to Newark?